“Lee’s army is really whipped,” Federal commander Ulysses S. Grant believed. Casualties mounted on both sides—but Grant kept coming. Although the great, decisive assault had eluded him, he continued to punish Lee’s army. The blows his army landed were nothing like the Confederates had experienced before. The constant marching and fighting had reduced Robert E. Lee’s once-vaunted army into a bedraggled husk of its former glory. In Grant’s mind, he had worn his foes down and now prepared to deliver the deathblow. Turning Lee’s flank once more, he hoped to fight the final, decisive battle of the war in the area bordering the Pamunkey and Chickahominy rivers, less than fifteen miles from the outskirts of the Confederate capital of Richmond. “I may be mistaken, but I feel that our success over Lee’s army is already assured,” Grant confided to Washington. 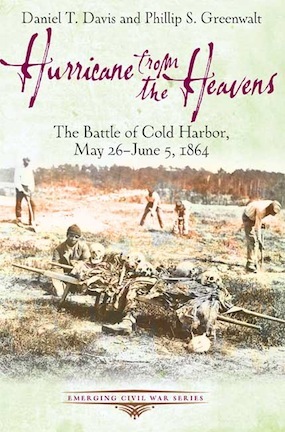 Grant would find his answers around a small Virginia crossroads called Cold Harbor—and he would always regret the results. Phillip, really enjoyed your talk at the Lincoln Davis Civil War Roundtable this evening. Great incite, comfortable and informative presentation. Looking forward to reading Hurricane From the Heavens. My last name is Worsham and my family’s roots come from the Bermuda Hundred area near Richmond.. My great great grandfather was born there, but ended up moving to IL and serving in the IL 119th, while his brother who remained in VA served in the VA 23 (I think, if I remember correctly). One of his cousins, John Worsham, was in Jackson’s army and wrote, “One of Jackson’s Foot Cavalry. Enjoy Florida.